The Pope Paul VI Institute provides medical professionals throughout the world with training and support to help extend the Institute’s medical breakthroughs to women and families across six continents. The Institute’s primary source of education and training is its Education Program, which consists of two full weeks of training held annually in the fall and spring. In Oct. 2015, one of the many medical professionals to begin the Institute’s Education Program was Dr. Angelica Maria Sarmiento, an obstetrician from the South American country of Paraguay. 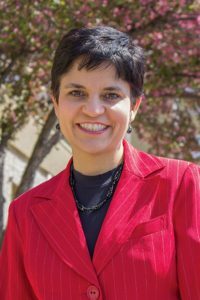 Dr. Angelica first heard about the Pope Paul VI Institute after being contacted by a local reporter who was writing a news story about NaProTechnology. “I declined the request for the interview because I hadn’t even heard about NaProTechnology at the time,” says Dr. Angelica. Having a strong background in both gynecology and bioethics, however, Dr. Angelica’s interest in NaProTechnology was piqued. It was not until after two other chance encounters and some additional research that Dr. Angelica made the decision to pursue training at the Pope Paul VI Institute’s Education Program, regardless of the time, travel, or cost. “When you are trying to follow God’s will, He will pave the way,” Dr. Angelica assured herself and enrolled in the Institute’s medical consultant program. But the “road” did include its bumps. After some prayer and contemplation, Dr. Angelica made the decision to enroll in the Education Program Practitioner track as well. “I felt that God was asking me to take another leap of faith,” she said. In April, Dr. Angelica completed Educational Phase II in Omaha in order to provide services to women and couples in her hometown of Asunción, Paraguay, where she is currently operating a growing NaProTechnology practice. I thank God every day for the Pope Paul VI Institute. Edith Lorraine Karpf was born into this world on April 1, 2015. She has been with me, in my arms, every day for the past year, even while I do my job as Development Associate at The Pope Paul VI Institute. The reason we have been able to spend this precious time together is because of Dr. Hilgers’ office baby policy. Since the very beginning of the Pope Paul VI Institute, Dr. Hilgers has allowed employees of the Institute to bring their babies to work with them for the first 12 months, if the job allows. 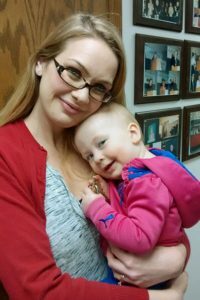 While Dr. Hilgers requires a high quality of work performance from his employees, he understands the needs of the family and the importance of nurturing the bond between mother and child. This is a testament to Dr. Hilgers’ dedication to building strong families! The Institute is a very special place because of the important work being done to make the pro-life reproductive health care found in the Creighton Model System and NaProTechnology widely accessible. There is no way I could adequately convey how truly incredible it is to be an Institute employee! The Institute is definitely not just a place of employment — it’s a family.